Moonbeam is supplied at a height of between 1.2 and 1.8 metres in a 12 litre container for year round planting and better results than from either bare-root or rootballed stock. Dear Senior Dogsbody, Thank you for your enchanting email. I am very pleased with the trees. The packaging was excellent and the trees in very good condition when they arrived. I was particularly impressed with the fact that they were very similar in conformation which will mean that they will look even better in the place that I have reserved for them in the front of our small wood. Willow, Alder, Birch and Poplar may help lower the water level so long as you do not have permanent standing water e.g. your local diving and sailing club meets on your lawn. 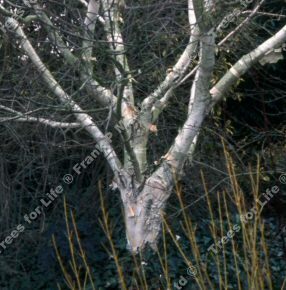 All our Betula are grafted onto Betula Alba Pendula rootstock.